I know it’s actually 2 days away, but I wanted to share these wonderful baked cake doughnuts with you! Tuesday I will be making a special dinner for Russell and I to celebrate the occasion together. I still haven’t decided what we will be having as a side dish, but I do know that we will be having crab cakes for the main entree and molten chocolate cakes for dessert. I also want to make something special for breakfast--I have come across more recipes for baked doughnuts than I can count, and have finally purchased a doughnut pan to make my own. 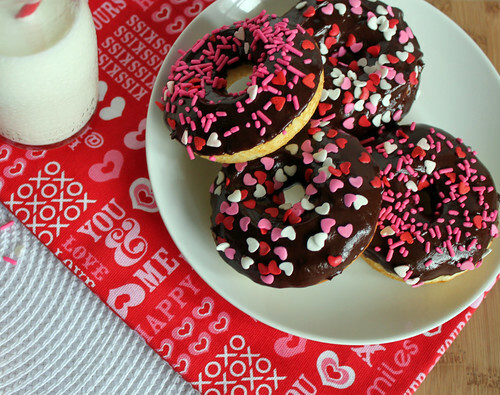 I wish I had bought one sooner because I am surprised how easy baked doughnuts are to make! These come together quickly and bake in under 8 minutes. At first I was going to make a vanilla glaze as the topping, but ultimately decided that chocolate would be better. I’m so glad I changed my mind--the chocolate icing is perfect with these! I modified the original recipe to make 6 doughnuts…with it only being Russell and I eating them, 6 was plenty! Preheat oven to 425 degrees F. Lightly grease doughnut pan. In a small bowl mix together milk and vinegar, set aside. In a medium sized bowl, sift together, flour, cornstarch, baking powder, salt, and sugar. Stir in the egg and melted butter into the milk and vinegar. Pour the egg mixture over the sifted flour. Stir until just combined. Transfer batter to doughnut pan until evenly distributed. Bake for 7-8 minutes. Let cool in pan for 1-2 minutes. Remove and let cool the rest of the way on a wire rack. For the chocolate glaze: In a small bowl, combine the chocolate chips, oil, corn syrup, and water. Microwave on 50% power in 30 second increments, stirring in-between, until melted. 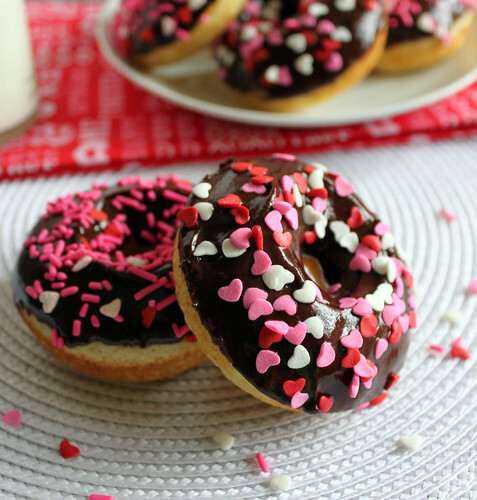 Dip half of each doughnut into the glaze. Top with sprinkles, if desired.